This tag allows you to output customer reviews for the product you are currently viewing. 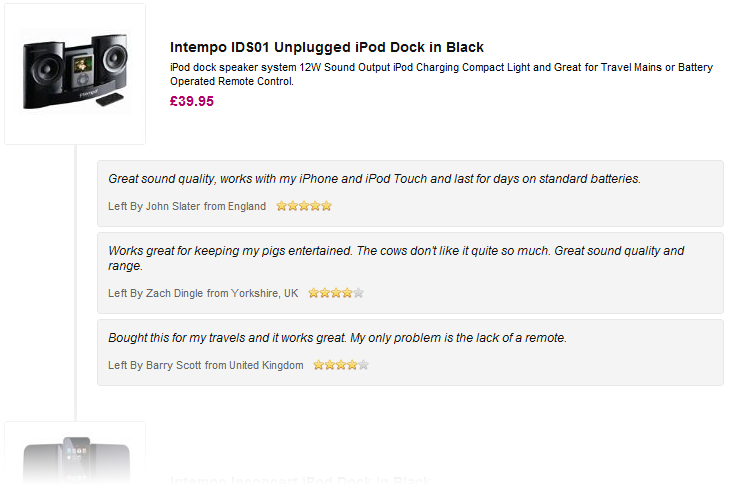 Reviews display with a star rating, customer name and description of the review. This tag can only be used if the "Customer Reviews" feature has been installed on your EKM shop. in it's most basic form the customer reviews tag will output a table layout of all customer reviews for the product you are currently viewing. The advanced version of this tag allows you to output customer reviews with custom HTML. This gives you more control over styling and layout. Specify whether or not you want the customer review tag to display. This should be left as "auto" typically so that if the feature is uninstalled it will be removed from the website automatically. When logged in you will see edit buttons beside the reviews allowing you to remove them. This attribute allows you to specify where those edit buttons will appear. The product review tag can be used throughout your website, this attribute allows you to specify which product's reviews you wish to display. If on the product page you can specify auto which will use the current product's ID. This attribute can also be set to output all customer reviews on a given shop. This is useful when wanting to have a reviews page where all reviews can be output. Specify your own product ID and reviews for that product will display. Will display all reviews on an EKM. This is useful when having a webpage which outputs all customer reviews left on a shop. This will get a random review for a random product. This is useful for placing rotating reviews on your website. This attribute allows you to specify any HTML content you wish to display before the reviews are output. This would typically be a "customer reviews" header and link to allow users to write their own reviews. Specify your own opening HTML to go before the customer reviews. This attribute allows you to nest some attribute tags to output review information or links. Outputs a URL to the "write review" form. Outputs the product ID of the product being reviewed. Useful when outputting random products and needing to display the product information. Outputs the average star rating for the current product. Outputs the total number of reviews for the current product. This attribute allows you to specify any HTML that will be output for each of the customer reviews. Specify your own opening HTML. This attribute allows you to nest some attribute tags to output review information. Outputs the name of the person reviewing. Outputs the geographical location of the person reviewing. Outputs a graphic showing the rating the reviewer gave the product, in stars out of five. Outputs an integer value of the rating the reviewer gave the product. Useful for outputting your own custom star images or rating graphics. This attribute allows you to specify any HTML content you wish to display if there are no reviews to display. This would typically be a message asking for customers to leave a review. Specify the number of reviews you would like to display on this page. Specify an integer value for the maximum number of reviews you wish to display. Specify the order in which you wish your reviews to display. This could be useful if you wanted only positive reviews to appear first. Display reviews ordered by date in ascending orders. Display reviews ordered by date in descending orders. Display reviews ordered by rating in ascending orders. Display reviews ordered by rating in descending orders. Sets whether the tag will output with rich snippets or not. By default they will output. It is recommended that you only turn off rich snippets when you use this tag more than once on a page. Outputs the reviews with rich snippets. Outputs the reviews without rich snippets. Outputs when there is a new line in a review's content. Specify HTML you want to use to create a new line. When nesting this tag you do need to ensure the start and end of the tag are prefixed with nested_ and that all single quotes ' are replaced with " double quotes. It may be useful for you to have a customer reviews page on your website. Perhaps you want to show a long list of reviews for products on one page, perhaps you want to call this a customer "testimonials" page. In this example you can output all the reviews for all the products within a category.